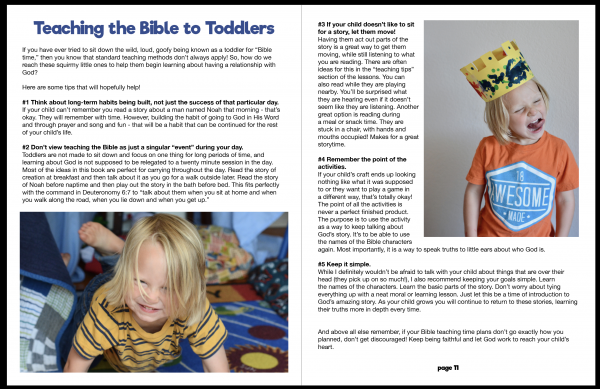 Are you ready to start teaching your little one the Bible, but you’re not quite sure how to get started? Play Through the Bible takes the truth of scripture and helps you teach it in a way that every toddler will go crazy for – play! With over 95 simple ideas for crafts, activities, and more this guide is guaranteed to have something that every kid (and parent!) loves. So get ready to pretend, craft, run, dance, eat, sing, and PLAY through the Bible together! Want the DIGITAL E-BOOK? Please click “add to cart” below. Please note that the paperback copy is sold only through Amazon which can be accessed via the link above. No refunds will be provided for mistakenly purchasing the digital product. Q. What stories are included? A. In Play Through the Bible vol. 1, there are fifteen Old Testament stories included: Creation, Adam and Eve, Noah, Abraham and Sarah, Joseph, Ruth, Samuel, David, Elijah, Josiah, Daniel, Jonah, and Esther. Q. Is there a print version? A. Yes! You can order a print version through Amazon HERE. This listing is a DIGITAL version which will be emailed to you in pdf form. Q. Can I use Play Through the Bible with my church group? A. Yep! Many people have enjoyed adapting Play Through the Bible to use with their church class or play group. Just pick and choose the ideas that work well for your group. Q. What age is this for? A. 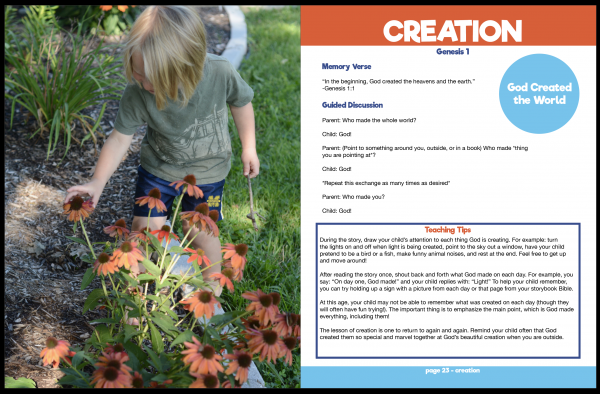 Play Through the Bible was created with toddlers in mind! Age two is usually when children are ready for the majority of activities included (although some may be ready earlier!) and they will continue to enjoy them throughout their preschool years. Q. Will my older child enjoy the activities? A. While not specifically designed for them, many older children will have fun with the ideas in Play Through the Bible! 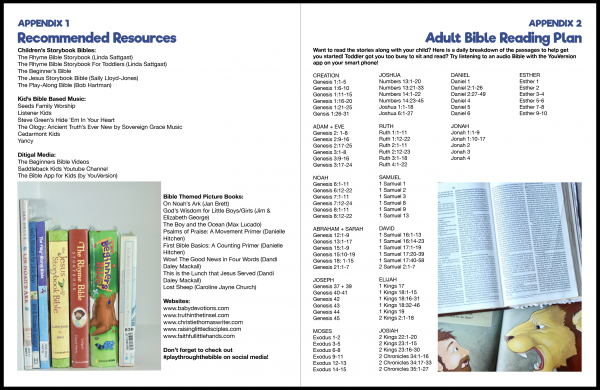 If you have an older child, you may want to check out our Old Testament Adventure Devotional. Q. What type of supplies will I need? A. 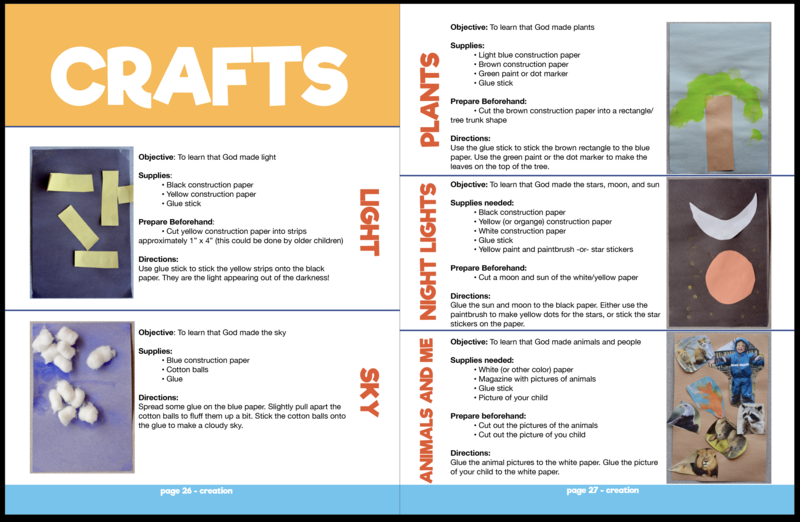 Play Through the Bible was specifically designed to be used with the most basic of supplies! Most crafts are done with construction paper, glue, and crayons. Additional craft supplies are things that are simple and easy to grab from a local store or online! As far as the activities, those are easily able to be completed with what you already have laying around the house. 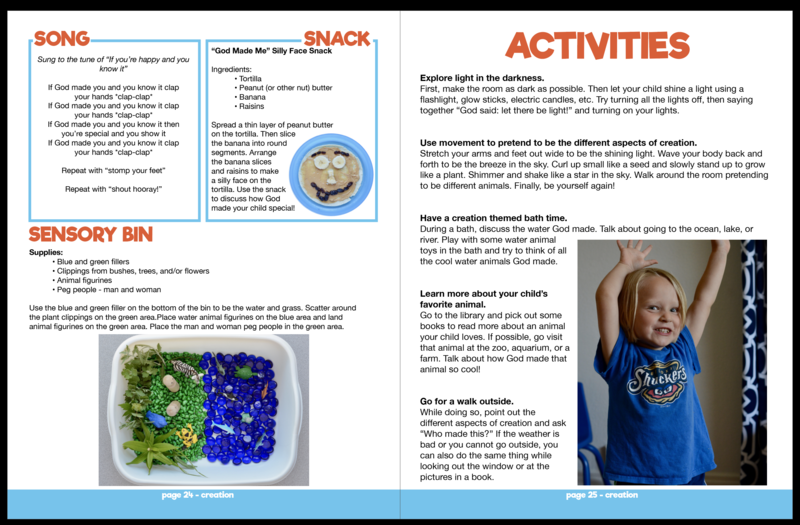 If you want to try the sensory bin ideas, you will need a few things, like filler items such as beans or rice. There are also instructions to make wooden Bible peg people to use to play the stories. They aren’t necessary, but are a fun addition! Q. How long do the activities take? A. Most ideas in Play Through the Bible can be prepped in a matter of minutes and finished in the same time span it takes for your busy toddler to lose interest! Plus, many of the ideas can be incorporated into your normal daily routine. Q. Is there a New Testament version? A. A New Testament version of Play Through the Bible is already in the works! It takes a lot of work to create the plans, test them, photograph them, and design the book, so a release date for volume 2 has not been set yet. Subscribe to receive updates to Steadfast Family so you don’t miss out on any Play Through the Bible news! This is a great resource for teaching Bible stories to toddlers and preschoolers. I love that it has crafts as well as non-craft activities that are fun and engaging to bring home the point of the story. 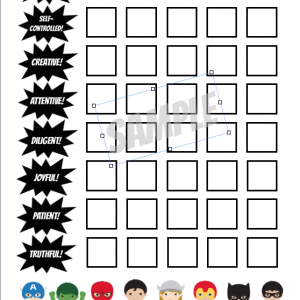 There are so many activities for each story that it would be easy to customize the lesson based on how much time and attention you have, and you could easily do the stories more than once with different activities. The teaching tips and conversation starters are so helpful too! 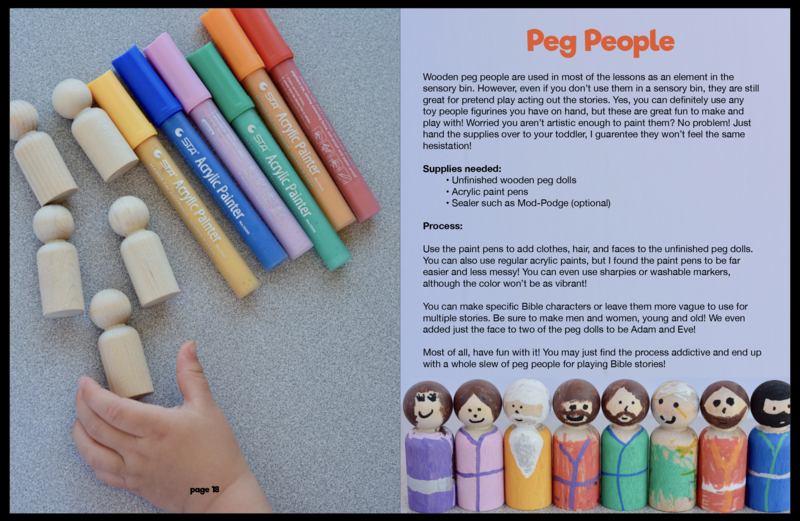 I know there are a lot of free resources out there that have activities like this, which was one of my main hesitations about this book, but I really love how it is all compiled together and there really are SO MANY hands on activities to do beyond crafts and coloring which I think can be hard to find. Earlier this year, I was struggling to find the right resources to engage my 2 year old in Bible time. Finally, I came across Liz Millay’s mini series online and I immediately knew this would get my daughter involved. Fast foward to a few weeks ago when I found out she was doing a book- I knew I needed it! There are crafts, snacks, and avtivities for every lesson. Also, I don’t have to spend time trying to change the lesson in order to make it inderstandable for toddlers- Liz already did that! I highly recommend this book. If I were a rich woman I would buy several copies at a time and give them all of my mom friends bevause this book belongs in the home of every family with toddlers! What a resource! You can clearly see the time, care, and thought that went into creating this amazing book. As a mom to 3 under 5, I feel a tremendous responsibility to teach my children about the Lord, and Liz’s Play Through the Bible series makes doing that fun and exciting for them. We loved the PTTB online series and cannot wait to incorporate this into our school routine this year. 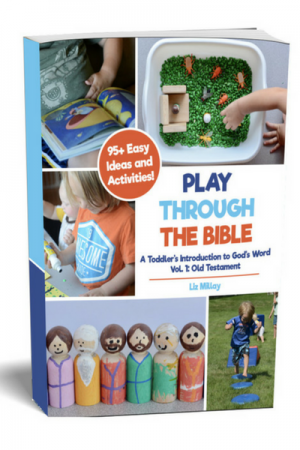 Having served in children’s ministry for over 20 years, not to mention being a mom of three, “Play Through the Bible” is one of the most engaging, age-appropriate, and FUN resources for smaller children that I’ve ever seen. 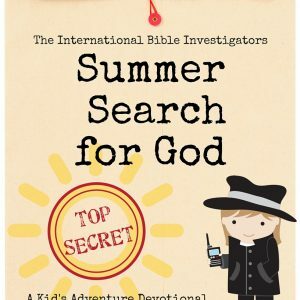 It is a must-have for any parent who wants to introduce their little one to the stories in God’s Word in a way that your child will really grab on to. 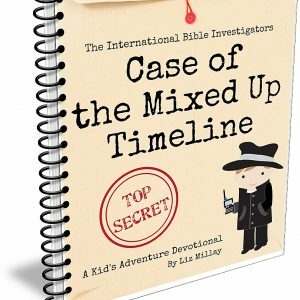 With lots of creative, yet simple ideas for activities, crafts, snacks, and more for each of the 15 Old Testament stories, you can easily adapt them to fit how your child learns and what time and supplies you have available. Doing the lesson in the morning and activities and crafts throughout the day or following week means that your child is hearing the Word through repetition and in a variety of ways! Plus, Liz gives you plenty of tips for teaching each story at a little child’s level. One of my favorite things is how she brings out two focus points for the lessons – one about the characters and one about what God is doing in the story. With all the tools and ideas in this book, and the confidence and inspiration you’ll gain as you use it, you’ll be able to continue with your own ideas for sharing other Bible stories with your child. I’m truly excited about how enjoyable and impactful this will make Bible time for my little guys (and myself)! My 4 and 3 year old love the activities in this book! (and my 9 month old loves the songs!) We enjoyed using the original version when my 4 year old was younger, but it is much easier to use in a book format and the pictures make it so exciting for me and my kids! There are a variety of activities to go along with each story and it doesn’t take a lot of pre-planning for us parents. The sensory bins and the peg people are a huge hit at our home! 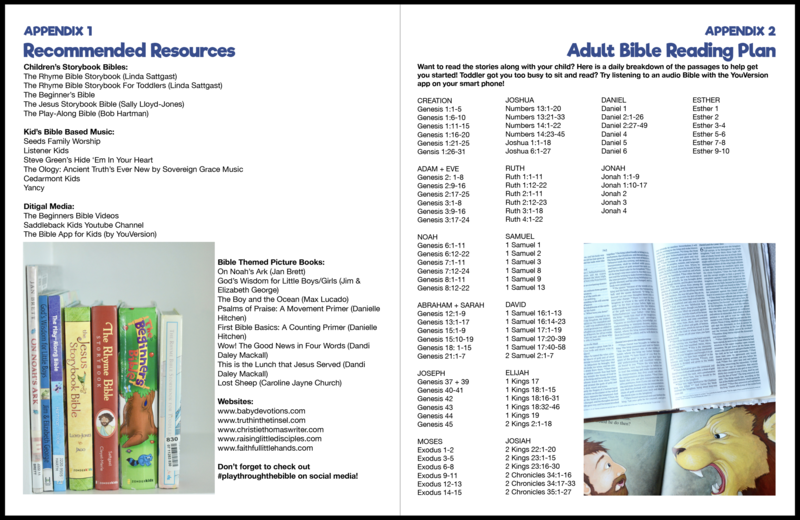 I also like the Adult Bible reading plan at the back of the book for parents to follow along during their Bible time.